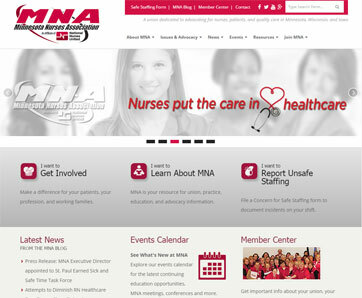 The Minnesota Nurses Association requited a complete website redesign and migration to a new content management platform. HSS provided a comprehensive strategy from the ground up, starting with strategic planning and information architecture, to wireframes, user interface design, development, deployment, and ongoing support. The new website utilizes a responsive mobile-friendly design that scales across all types of devices and screens, and also integrates with their membership management system to display event listings and staff contacts that are always current via API.